Do you ever find yourself forgetting to do tasks around the house, or need to be constantly reminded to do them? 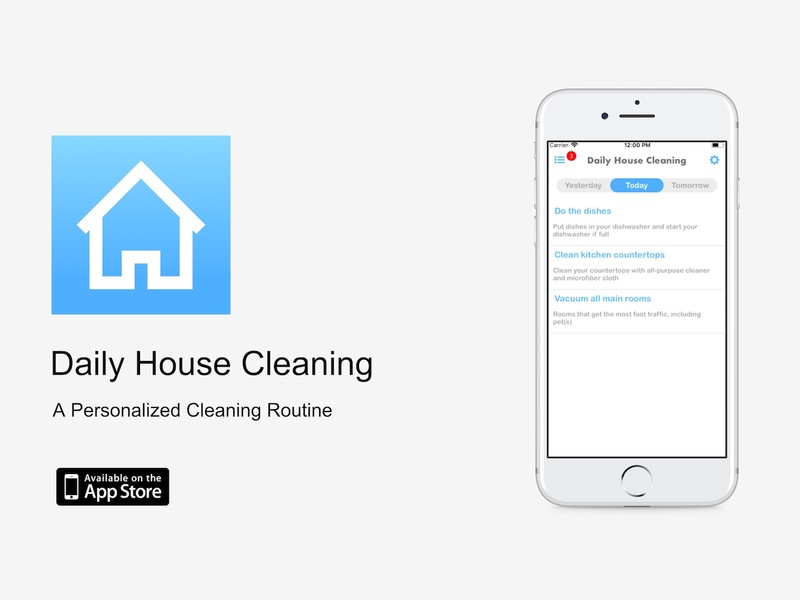 Then Daily House Cleaning is the next app you need to download. Daily House Cleaning helps you create an organized cleaning routine, and simplify it to a daily checklist for you to follow. It is personalized around your life, so your cleaning routine is the most efficient for you. The app has a beautiful interface, which allows the users to easily manage the app. While very simple, the app does exactly what it is made to do—give you a reminder of what needs to be accomplished on a day-to-day basis. After you make an account, you will be asked a few questions that will affect the cleaning tasks you have. Then you’ll get a customized checklist that gives you certain cleaning tasks to be done at your own pace. Some tasks are meant to be done once a day, other tasks may only need to be completed weekly or even monthly. The app allows you to work on a checklist for a day, part of a day, or even more than a day. The most satisfying part of the app is being able to click “Done” on a task and see it vanish. It will remind you of making to-do lists and writing in things you’ve already done just so you can have the pleasure of crossing them off. Having a simplified cleaning routine provides many benefits as well. It helps you save time, which gives you more time to spend on the things you want to do. It also reduces stress because you won’t spend an entire day cleaning or time worrying that you forgot to clean something. With a cleaning routine, you have greater productivity in your day because you maximize your efficiency while cleaning. If you tend to be a procrastinator, Daily House Cleaning will help you remember all the things you need to do and when to do them. What you will especially like is that it is customized to your life—how big your house is, how many people live with you, even the number and kind of pets you have. It also puts the unnoticed items, such as baseboards and lampshades on your schedule. This app will really help simplify your household cleaning responsibilities and make cleaning less stressful. Click here to Download on the App Store today! Disclaimer: I have teamed up with Daily House Cleaning App in support of this campaign. We received compensation for participation in this campaign. However, all thoughts and opinions are my own.